Here are useful tips to improve your art business. Know Who Buys Your Art. If your art is florals and landscapes, this is harder than if you are in a niche such as nautical art. Nonetheless, you need to define your buyers. Are they mostly women or men? Are they over 50 or under 40? Are they outdoor types who drive Jeeps, or urbanites who drive a BMW? There is nearly always some crossover, but you can bet your buyers have a sense of who they are. The more you define them, the easier it becomes to put yourself among them. And, the easier it becomes create for your audience. 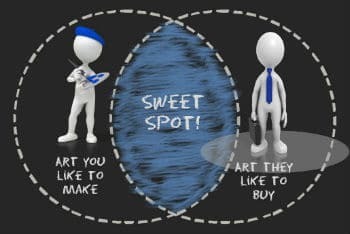 When you find it pleasurable creating the art your collectors like to buy, you have hit the “sweet spot.” Having as much data about your buyers will help you grow that sweet spot and your sales. Go Where Art Collectors Go. Whether serious or a casual art buyer, you have to find them and work to be among them. In the ethos and pathos of today’s art buying culture, it is a fundamental method to improve your art business. If you have chosen to sell direct, which is the recommended high priority for you, then you need a systematic program to put yourself in a position where you frequently meet and mingle with collectors. This is true whether you sell art direct and in person, or digitally online. Selling art is a competitive business. Collectors and casual buyers have overwhelming choices of what art to buy, and where they buy it. Putting yourself and your artwork amongst them makes it easier for them to choose to buy your work. Have a plan to meet serious collectors and art buyers, and folks with influence who can help you and your art career to grow in awareness and sales. The best way to do this is to be out in the community as much as possible. Active participants in the art community have more chances to sell their art. This is true locally and online. Get into local and regional art shows. Take part in open studio tours. Enter your work in juried and non-juried exhibitions, primarily targeting those with the best reputation or profile in the art community. Join LinkedIn, and Facebook groups, and other online communities that are of interest to your kind of customers. If you are in a niche, be active within the interest groups around it. Don’t just look for ways to donate art to some worthy organization. Get involved. Meet people. Make a difference in the organization or community. Doing this allows your buyers to come to you due to your contributions and participation. Selling art direct at that point, or getting referrals to qualified buyers, becomes easier and natural. All this leads to the next point. Have A Presence And Become Known. Today, you have the tools to shape your reputation and improve your art business. Websites, blogs, email marketing, publicity, and press releases can go a long way towards defining who you are as an artist. There are many ways to get notice on art websites and blogs. Look for opportunities for feature stories, interviews, or human-interest angles for highlighting you and your work. Become an active participant in online discussions and forums that are of interest to your target audience. According to an article in the Los Angeles Times Magazine, Howard Fox, a curator of the Los Angeles County Art Museum, annually attends hundreds of exhibitions and visits 50 to 60 galleries regularly. He also gets letters, emails, slides and invitations to shows, and to view websites. Fox says he finds the incredible velocity and volume of the offerings makes it very difficult for an unknown artist to stand out with him. He believes what it takes, besides talent, is a slow, steady drip of repeated exposure to make a lasting impression. Working to master the art of publicity will be an enormous help to you in keeping frequent mention of your name in appropriate media. The ways to increase your presence in your community are immense. If you are not showing at an art fair, be there anyway as a participant. Talk to people while you are there. Become a regular at gallery openings, other events where art is included. Get involved with your local museums, and affinity groups related to your art. Look for lectures, workshops, non-profit gatherings. Look for meetups in your area. Even better, start a meetup with a topic that will interest potential collectors. If you paint wine vignettes, join a local wine tasting group, and so on. Be prepared wherever you go to hand out something more than a business card to promote your work. Obviously, you should be choosy about to whom you present your handout material, but if you have it ready now, it will help you to ratchet a chance encounter into a meaningful relationship. These days, having your portfolio on a tablet makes this easier than ever. Just by becoming a regular face on the scene, awareness of you increases and you become better known as a result. What happens is as your familiarity increases, and people begin to recognize you, the number of people you meet who are potential collectors grows exponentially. Even if you are uncomfortable at first, which is understandable for some people, that feeling will subside and lessen with each appearance you make. If you are willing, learn to give presentations on subjects of interest to you. Pick your topic or topics and make it known you are available. You might talk about the importance and impact of the arts community to your area. If you have famous artists or other people from your area, study their lives and work up a 30-minute slideshow to talk about them. If you are in an urban area where there is a concentration of galleries, you could start an art tour side business. That is an excellent way to get to know every gallery owner in your area. Make sure your local media is aware of your expertise and you can become the go-to person for them on your topic. You can spend all your money and more on marketing, which will wreck your career and your finances. To avoid this, make sure you do these two very important things when it comes to marketing. First, use the best, most suitable tools available to spread the word about you and your art. There is not enough time and money for you to do everything and do it well. So, you have to choose the tools most likely to give you the best return with the most impact. While I believe a website, blog and email marketing are foundational; there are very successful artists who disprove me by lacking one or all those items. Regardless, those are just a few among dozens of ways to market your art. The best thing you can do is find things that work and become a master of using them. Somehow, many artists have an ill-conceived notion that asking someone to buy their work is crass, and that doing so devalues the work. This is all wrong. You have gone to the trouble to make work you feel collectors and buyers will want to own. You have spent considerable time and money to develop marketing plans, tools and schemes to get notice for you and your artwork. Now, they might be on your website or blog, or they might be in a face-to-face meeting with you and you decide not to ask them to buy. I get how this mind warp has happened, but it has to stop if you want to succeed. If you think of your website or blog as anything other than a marketing tool from which you can sell your art, then you have a bad belief. The only reason to spend the money and time to build these things is to get buyers – and get them to buy now if possible. If you don’t have your online presence e-commerce enabled, you are missing sales. If you are linking your web visitors to another site where they can purchase your art, you are missing sales. Each additional click required to make a sale drops your conversion percentage, dramatically. At the least find a way to embed the shopping cart from your online gallery into your website. It is not vulgar to have a call to action that asks someone to buy. You are not in the information business, you are in the building a collector base business, and you are in the business of selling art directly. The more you succeed at doing these things, the greater your success will be. You can construct a site where it is easy to buy directly from you, and, in a way, that exemplifies you and your art in a dignified, classy manner. When it comes to selling direct, you probably need some help. Most of us are not born salespeople. We just learn to get better at it. There are no acceptable excuses for failing at sales. You can learn some simple tips and techniques that will drastically improve your closing ratio. Imagine if over time you were able to get two or three of five collectors you meet to buy instead of one-in-five. Just getting to two would double your sales, and three triple your sales. Over the course of a year or a lifetime, that adds up to real money – like paying down a mortgage, or for a college education, or securing a comfortable retirement. You can find many posts on this blog about selling art. Many of them have been compiled into my Zen of Selling Art: Essays on Art Business Success e-book. Making your art is all about expressing your creativity. Making your art business successful is about making your life for you and your family better. Be as creative and thorough in marketing and selling your art as you are in making it. Don’t shortchange your family or yourself because you are carrying around misconceptions about how you can respectably manage your art business.